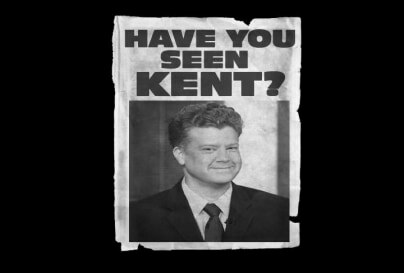 Have you seen Kent Jones? For further image reference see here and here. Click "+ADD ANOTHER FILE" below the second field if you are uploading multiple items. If you'd rather use e-mail, is actively monitored. No picture? Describe where you've seen him! Images must be .gif, .jpg/jpeg or .png formats. Videos must be in .avi, .mov, .mpg/.mpeg, .wmv, .asf, or 3gp formats. Submissions are reviewed by MSNBC.com and/or NBC News editorial and published or broadcasted at its discretion. My e-mail address will only be used to notify me if/when my content has been published on MSNBC.com or broadcast on NBC News. My e-mail address and phone number may be used by NBC News and MSNBC editorial if it needs to contact me with questions about my content. All material submitted to MSNBC.com and NBC News (the “Submissions”) become the property of MSNBC and NBC News and will not be returned. Without affecting any of your ownership rights to the Submission, by submitting your Submission, you grant MSNBC and NBC News an irrevocable royalty-free, worldwide right, in all media (now known or later developed) to use, publish, alter or otherwise exploit your Submission and to sublicense such rights to a licensee at MSNBC and NBC News' discretion. You hereby forever release MSNBC and NBC News and any of its licensees from any and all claims you might have in connection with its use and exhibit of your Submission as set forth above. You also agree to sign (your parent or legal guardian if you are a minor in your state or Province) any necessary documentation to effectuate that license and release. Your Submission must be your own original work and, by submitting your Submission, you represent and warrant that: it is your sole original work; and you have obtained any and all consents, approvals or licenses required for you to submit your Submission (including obtaining the written consent of all 3rd parties, where applicable). Your submission must not contain material which is violent, pornographic or otherwise obscene, illegal or racially or otherwise morally offensive. You agree to indemnify and hold harmless MSNBC and NBC News, its parents, subsidiaries and affiliated companies, each of their respective licensees, successors and assigns, and each of their respective employees, agents, representatives, officers and directors from and against any and all claims, losses, costs, damages, liabilities, losses, costs and expenses (including, without limitation, attorneys; fees) which arise out of any breach of this agreement or any of these covenants, agreements, obligations, rights, representations or warranties set forth herein. You waive any claim of infringement (including without limitation copyright, trademark, patent, trade name, trade secret, etc.) against MSNBC or NBC News or their licensees based upon access to or use of your Submission. If you do not want to grant MSNBC or NBC News the foregoing, please do not submit your Submission. Neither MSNBC nor NBC News is obligated to use the Submission.